Updated December 16, 2016: A reconciliation of the City and TTC versions of the budget has been added at the end of the article. Following numbers in the development of budgets can be like a game of Three Card Monte on a grand scale. Information is presented in various ways, at times in ways that obscure understanding, and at others where the path from “version a” to “b” is missing a crucial step. This article is an attempt to reconcile what has been presented to date. As and when further revisions occur, I will add updates here. TTC management begin work on the following year’s operating budget midway through the calendar year. At that point, the actual results that will come out by year-end are unknown, and only some trends may be apparent. The starting point is the current budget which may or may not reflect the actuals by year end, but they have to start somewhere. Budgets in Toronto are typically presented in terms of year-over-year “pressures” so that, for example, if there is a known increase in costs such as fuel or electricity, this translates to an amount by which this budget line will increase. Basic cost changes can be compounded if there is a substantial change in TTC operations such as the expansion of bus service or the opening of a new subway line. This is a fundamental issue in transit budgets – they must absorb not only changes in costs related to inflation, market rates, and labour contracts, but also the change in scale of operations. Typically the gross cost of the system goes up greater than the rate of inflation, although this can be offset by cost reductions and that favourite target of budget hawks, “efficiencies”. The TTC’s Budget Committee was supposed to meet in June, but this was cancelled and a chance to get an early look at the 2017 situation was, therefore, lost by the Board (at least to the extent of any public discussion). In September, there were two separate meetings for the Capital and Operating budgets respectively. Finally in late November, the Board approved its Preliminary Budget for 2017. This went into the City’s budget process, and further refinements proposed by the City Manager await actions by the City Budget Committee on December 19, followed by Council in the new year. The TTC Board will then have to deal with the difference, if any, between the requested subsidy and what they actually will receive from Council. At its July 12, 2016 meeting, City Council endorsed Mayor Tory’s request for an across-the-board 2.6% saving in spending by all departments and agencies. g. avoid “offloading” expenses to other City Programs and Agencies. Seven of the eleven TTC Board Members are also Councillors. Although there were some efforts to constrain the effect of this direction on the TTC, these did not pass, and in the end all of the Councillors who sit on the TTC Board endorsed the 2.6% target cut. For the TTC this applies only to the portion of revenue that comes from City subsidy (the “net” budget position), not the total TTC budget which is substantially funded by fare revenue. With the subsidy sitting at about 28.4% of total TTC revenue, a 2.6% cut translates to about 0.74% of the gross budget or roughly $12.8 million. The situation is complicated by the Wheel-Trans budget which is almost entirely paid for from City subsidy. The 2.6% cut would reduce the Wheel-Trans subsidy by $3 million. These two cuts were combined to produce a TTC target of $15.8 million, but the actual budget trimming fell almost entirely on the “conventional” system’s budget, not on Wheel-Trans. 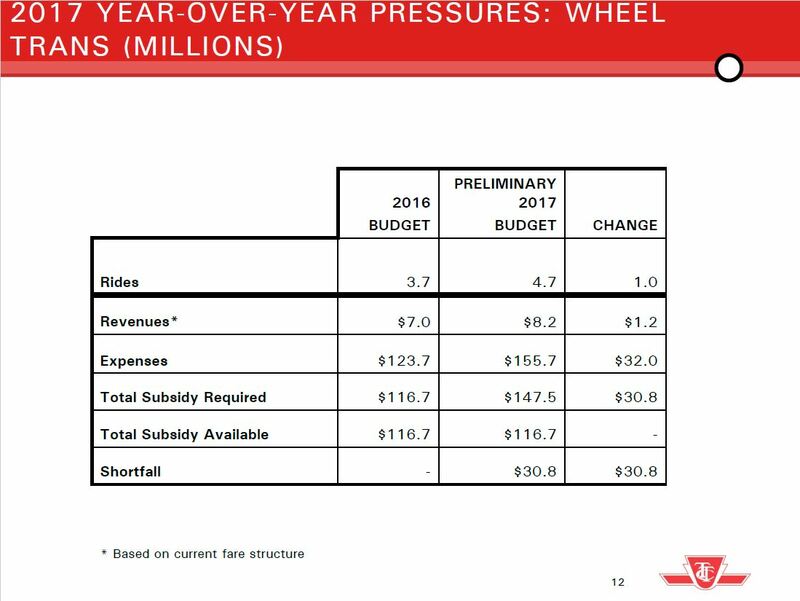 This situation would later be compounded by the strong growth in demand for Wheel-Trans service which is crowding out better funding for the main part of TTC operations. 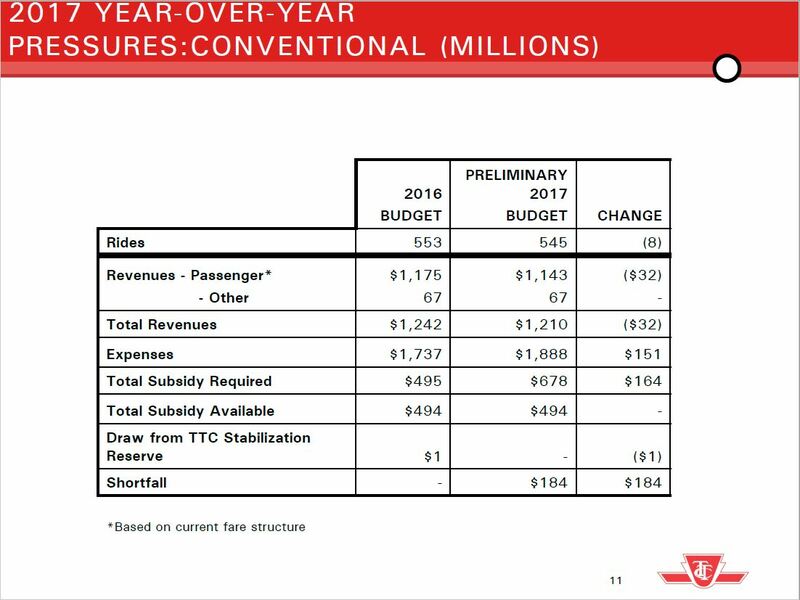 On September 21, 2016, the TTC Budget Committee was given a preliminary look at the situation for 2017. This was not a detailed budget, but rather a list of pressures on costs for 2017 together with a list of potential cuts to satisfy the 2.6% target. The budget presentation included summaries of the opening positions for 2017 for both the conventional services and for Wheel-Trans. At this point, the only adjustment in revenue was for reduced farebox income (the combined effect of lower riding than the 2016 budget, and absence of a fare increase at this stage of the budget). The subsidy shown here is at the 2016 level before the 2.6% cut is applied. Expenses rise by $151 million, the combined value of the expense pressures. The TTC approved a number of cost reductions totalling $15.4 million in the conventional system budget and $0.4 million in Wheel-Trans to “satisfy” the City’s target. This exercise was a sham intended only to claim that the TTC was “doing something” about budget problems even though it still faced a shortfall over ten times the size of the cuts made at this point. Moreover, the lion’s share of the “cut” was a windfall improvement in benefit costs due to reduced claim levels thanks to the unveiling of fraudulent activities by some employees and service providers. Most of this saving actually occurred in 2016 and reduced budget pressures in that year. It is carried over into 2017 only because the new budget is stated relative to the old one, not relative to probable 2016 results. This is money the TTC has already “saved”, but such are the peculiarities of political optics that this can be claimed as aiding the 2.6% budgetary target for 2017. The combined shortfall remained at about $215m because the budgetary savings were offset by the 2.6% reduction in expected City subsidy. One saving budget-to-budget that was not listed in the September changes was a reduction in Depreciation charges between 2016 and 2017. In 2016, this represented an operating cost of $33.449 million, but by 2017 the value is down to $29.0m. This would be a saving of almost $4.5m but it was not shown as an offset to the 2017 budget pressure, although it could be lumped in with the category of “other changes”. This line item will return as an issue in later versions of the budget. One decision had already been taken by management – the cancellation of service improvements planned for September 2016. This would lead to savings in 2016 as well as a budget-to-budget saving in 2017. In fact, the Service Budget (which expresses the planned service levels in hours) for 2017 had already been set in early August. The tables below show the 2016 budget and actuals, together with the planned 2017 budget. The months of October and November 2016 show a reduction relative to the planned amount of service. Going into 2017, the planned amount of service is slightly higher than in 2016 reflecting the carry-through of 2016 changes, but still lower than the originally planned fall 2016 levels. Note that although regular service has relatively little change, there is a large increase in projected hours due to construction. This is primarily caused by the Crosstown project, but the cost of this service is reimbursed to the TTC by Metrolinx. Another change for 2017 is that the City will pay the TTC for the cost of extra service triggered by construction projects such as the water main work on Queen Street that required extra service on 501 Queen for much of 2016. The additional service relative to budget in January 2017 is primarily due to the late delivery of new streetcars triggering bus operation with more vehicles (and hence operator hours) than planned. A few aspects of the TTC’s method of reporting income and expenses make reconciliation difficult. These involve revenue or charges received and incurred on behalf of others. The TTC provides some transit service outside of the City of Toronto to York Region, and revenue from this is shown as a distinct line in the budget. This will be declining in 2017 because YRT is taking over responsibility for some services now provided by the TTC. The cost of operating this service is buried in the operating budget. Presto provides fare collection services for the TTC in return for a percentage fee of revenue handled through that system. Changes in the charges anticipated from Presto are shown as pressure/relief points in the budget, but there is no actual revenue/expense statement for the fare revenue and Presto service. On a related point, the TTC provides front line support for the Presto-owned fare machines. There is no revenue shown as income to offset the cost. The TTC will receive payments from both the City of Toronto and from Metrolinx for the cost of extra service triggered by delays and diversions from their construction projects. These are not shown as a distinct sources of income although their value is higher than payments received from YRT. They are estimated in the body of the November budget report at $6m from the City and $18.7m from Metrolinx. In summary, there are agreements with external agencies that entail provision of work or service, costs and revenues, but in most cases these are not booked explicitly and are assumed to simply come out in the wash over the course of the year. Only the YRT income appears in the financial statements as a line item, and it is not booked against specific operating costs, let alone the capital costs associated with vehicles required to provide the service. At its November 21 meeting, the TTC Board was presented with an updated Preliminary Budget that included many other changes in an attempt to wrestle down the shortfall. In this report, the 2.6% cut is described as an additional pressure over and above the $215m even though back in September cuts had been approved to deal with that. A list of further budget changes brought the shortfall down to $99m including $41.4m in new revenue (fare increase, draw from reserves), and $75m in expenditure cuts. This was described in detail in my previous article about the budget and proposed fare increase. The combined effect of these changes brought the shortfall down to $99m. The proposed fare increase was described as bringing in $27m in new revenue, which would be a $5m net reduction taking into account the original $32m budget pressure from lower ridership. On a budget-to-budget basis, the drop is slightly greater at $6.94m. The net decrease in revenue taking various factors, notably a big jump in commuter parking lot fees ($3m on a base of $9.3m), is $4.5m. Of the $75m in cuts, $71m was taken from the conventional system budget and $4m from Wheel-Trans. It is worth noting that between the two budgets there are $9m in unspecified reductions or refinements with $5m on the conventional service and $4m on Wheel-Trans. At this point, the TTC attempted some “sideloading” of costs by shifting both Depreciation expenses ($29m) and the cost of Hybrid Bus Batteries ($8.5m) onto the City’s capital account. This violates item 3.g in the Council directive above, and moreover the basic accounting principle that Depreciation is an operating expense, not a capital one. From the City’s point of view, this was simply an effort to make the TTC deficit fall on paper, while offering no relief to City costs. From the TTC’s point of view, this change would bring the deficit down to about $61m. As noted above, the City does not agree with the transfer of Depreciation Charges or the cost of Hybrid Bus Batteries to the Capital account. This does not reduce TTC spending, but merely shifts it elsewhere in the budget. The deficit using the City’s numbers therefore rises by $37.5m (capital transfers) less $5.8m (disallowed costs) to $93.2m. If Council decides to approve the “new and enhanced” items, then the total rises to $99m. The TTC will likely advance a rationale for this spending at the City Budget Committee meeting. As often happens in budget debates, there will be a lot of talk about small amounts. Councillors tend to fixate on numbers that at best get into the tens of millions while ignoring much bigger issues elsewhere in the City’s financial problems. Depending on what stays in and what is removed, the TTC could face the need to find even more money by various schemes related either to service quality or fare levels. Mayor Tory has said both that service will not decline nor will fares rise, but if so, then he must find substantial new revenues to balance the TTC’s budget. That does not even address the many other calls for City resources beyond transit. The “net” values line up, but there is no explanation regarding the discrepancy between the City and TTC revenue figures which must be offset by a corresponding difference on the expense side of the ledger for these numbers to balance. The difference in adjusted revenue values is almost exactly equal to the value of the supposedly disallowed “new/enhanced” line as if somehow it will be paid for with projected higher revenues. I await feedback from the City on a query about this. The other kind of organization which employs creative accounting probably wouldn’t take too kindly to this nosing around. (Cue mandolins) Steve, don’t ever take sides against the TTC again! Steve: I have been “taking sides” as you call it for years. The issue here is that the manner of presentation of the budget can be confusing to those who are supposed to be setting policy, and there are inconsistencies in the way some spending and revenue are handled that I am surprised their auditors allow. It will be interesting to see if these items are restated in the notes to the financial reports. A related issue here is that members of Council and of the TTC Board have a quite ridiculous fetish about headcount, to the extent that they cannot deal with the concept that more service (or more anything) generally requires more employees unless there is a way to increase one within the existing workforce. It is self evident that it takes more drivers to drive 11 buses than 10, and this sort of scale effect operates in many parts of the system. Steve: I have been “taking sides” as you call it for years. Perhaps you missed my reference. It is a line that Pacino tells John Casale in “The Godfather”. Steve: Considering that I saw that film at Tiff only a few weeks ago, I should have caught that!